Fpdc – You will need to start with a foundation row of dc (included in this pattern). Chain 2 and yarn over (yo) and insert your hook from front to back between the posts of the first and second double crochet of the row below. Bpdc – You will need to start with a foundation row of dc (included in this pattern). Chain 2 and yarn over (yo) and insert your hook from back to front between the posts of the first and second double crochet in the row below. Bs – The broomstick stitch requires two steps to complete one row, a loop step and a crochet step. Insert your hook into the first chain or stitch and draw up a long loop. Place this loop on the knitting needle with the working yarn at the front of the work. Continue drawing loops through the chains or stitches and placing them on your hook until you have reached the end of your row. Move the working yarn to the back of the work. Count the first 5 loops and insert your hook from left to right underneath all 5. Carefully slide these 5 loops off your hook. Pick up your working yarn and yarn over (yo) and pull through the loop on your hook. Chain one to lock it in place. Sc 5 times around the loops. This will create the twist in the stitch. Pick up the next five loops just as before and sc 5 times across the top. Continue to the end of the row. 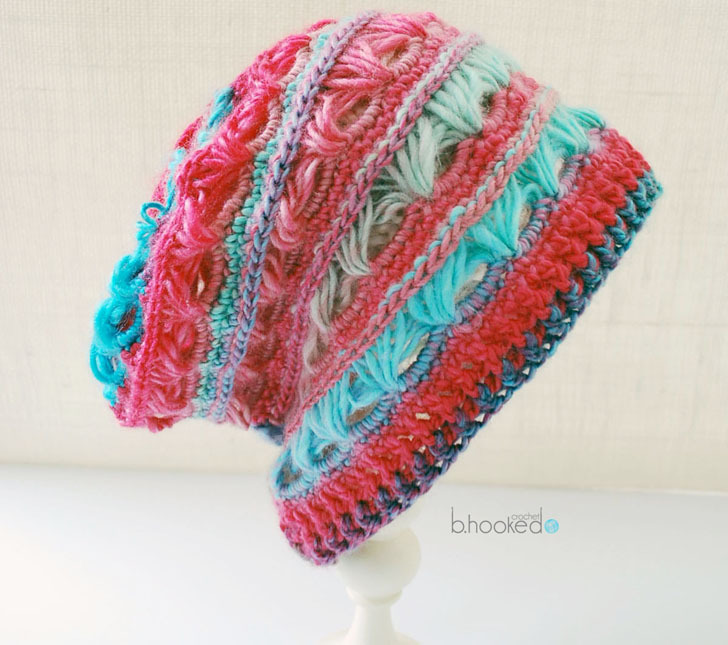 The Urban Broomstick Slouchy Hat is crocheted in the round working from crown to base. Crocheting the broomstick lace stitch in the round is slightly different from working a flat piece. This pattern will ask that you work your broomstick stitches off the knitting needle because of the shape. You will only be able to keep approximately 10-20 loops on the knitting needle at any given time depending on which round you are working on. Once you can no longer add stitches to your needle you must gently remove the loops and then place the last three loops created back on the needle to maintain your tension. Typically, the broomstick lace stitch is worked using 5 loops per stitch. When working in the round, during the increasing process you must only use 3 loops. Please note that no matter what number of loops you are using to create your broomstick stitch, you will always finish the stitch with 5 sc for this pattern. On the very first broomstick stitch you make, you should always lock in your stitch and chaining 1 followed by a total of 5 sc. This pattern utilizes the ‘magic ring’ to start working in the round. If you are unfamiliar with the magic ring, I recommend you take a look at my tutorial for crocheting the magic ring. If the magic ring is your natural enemy, I recommend checking out my tutorial for the alternate magic ring method. You may also enjoy the matching scarf! Fasten off and weave in the ends with your darning needle. Not trying to critique your pattern, but I seem to have trouble with slouchy hats being too loose and falling off. The front post double crochets don’t seem like they’d make a “stretchy” brim. I was thinking of trying this but working the 80 single crochet stitches onto smaller knitting needles (since they are a nice even number!) and doing a ribbed brim like knit 2 purl 2. I’ve never worked crochet onto knitting needles but I’ve seen/heard of doing it. Do you have any thoughts? I am having some trouble with the broomstick stitch on round 3 for the adult size. Is there a video tutorial for this hat? I am trying to print this pattern so I can make this great hat, but I am having trouble. Is there a pdf I can print instead? I’m so sorry for the trouble you’re experiencing with my newsletter sign up. I am unable to send out emails through this (temporary) technical difficulty. Thank you so much for your patience. 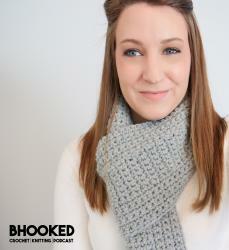 I will have it up and running soon and will email you the pattern personally! Oh, that’s fine! I was worried I was doing something wrong. Thank you so much for letting me know! I’ve seen slightly similar patterns like this one, but this is just the over-all best looking to me. Good luck with your email! Sorry you’re having troubles! I’d really love the new free pattern for the urban broomstick lace slouchy shown in this month’s newsletter, but every time I click to download the pdf, it asks me to subscribe — and when I do — it tells me I am already subscribed — which I know and here we go again. Help!